an acute or chronic disorder characterized by widespread and largely reversible reduction in the caliber of bronchi and bronchioles, due in varying degrees to smooth muscle spasm, mucosal edema, and excessive mucus in the lumens of airways. Cardinal symptoms are dyspnea, wheezing, and cough. Attacks or exacerbations may be induced by airborne allergens (for example, molds, pollens, animal dander, dust mite and cockroach antigens), inhaled irritants (for example, cold air, cigarette smoke, ozone), physical exercise, respiratory infection, psychological stress, or other factors. The signs and symptoms of bronchial asthma are caused by the local release of spasmogens and inflammatory mediators (for example, histamines, leukotrienes, prostaglandins) and other substances from mast cells, eosinophils, lymphocytes, neutrophils, and epithelial cells. Airway caliber may be abruptly and drastically reduced during a paroxysm or after diagnostic challenge with methacholine or histamine, and may quickly return to normal after administration of a bronchodilator (for example, inhaled β-adrenergic agonist or subcutaneous epinephrine). Asthma is a common disorder, with a prevalence of about 5% in the U.S., and a leading cause of illness and disability in people between 2 and 17 years of age. It is responsible for 14.5 million outpatient visits and 5,000 deaths yearly in this country. The prevalence of asthma has been increasing during the past 25 years, particularly in children under age 5. Asthma first occurring in childhood is more likely to be allergic in origin and to show seasonal variation. Chronic sinusitis and gastroesophageal reflux disease are statistically correlated with asthma. A subset of people with allergic asthma also have nasal polyps and sensitivity to aspirin and other nonsteroidal antiinflammatory drugs (Samter triad). Occupational exposure to airborne irritants or allergens causes at least 10% of chronic asthma in adults. Current views of the pathophysiology of asthma emphasize its inflammatory component and the risk of gradual, irreversible airway remodeling due to subepithelial fibrosis in poorly controlled asthma. Interleukin 13 has been implicated as a mediator of such fibrosis, and the presence of antibody to Chlamydia pneumoniae has been linked statistically to accelerated deterioration of lung function in patients with asthma. Current recommendations for treatment of chronic or severe asthma call for use of antiinflammatory drugs (particularly inhaled corticosteroids). Other treatments include β2-adrenergic bronchodilators (albuterol, terbutaline, salmeterol), xanthines (theophylline, oxtriphylline, dyphylline), mast cell stabilizers (cromolyn, nedocromil), and antileukotrienes (montelukast, zafirlukast, zileuton). Self-monitoring of peak respiratory flow rate with a simple portable device helps patients adjust drug doses for optimal effect. Avoidance of allergens, irritants, and other known triggers is essential to good control. A condition of the lungs with extensive narrowing of the airways, varying over short periods either spontaneously or as a result of treatment, due in varying degrees to contraction (spasm) of smooth muscle, edema of the mucosa, chronic or recurrent local inflammation of the submucosa with eventual fibrosis, and excessive mucus in the lumen of the bronchi and bronchioles; these changes are caused by the local release of spasmogens and vasoactive substances (e.g., histamine, or certain leukotrienes or prostaglandins) in the course of an allergic process. A tautological term; all ASTHMA is bronchial. An acute or chronic disorder characterized by widespread and largely reversible reduction in the caliber of bronchi and bronchioles, due in varying degrees to smooth muscle spasm, mucosal edema, and excessive mucus in the lumens of airways. 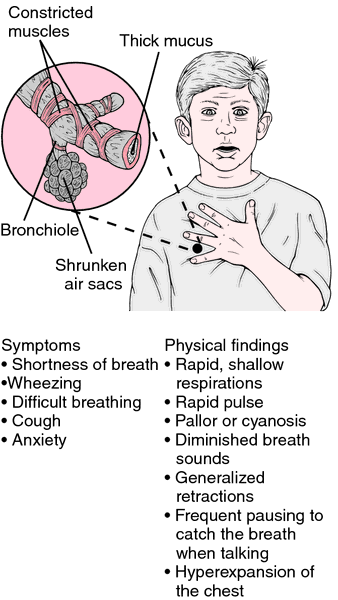 Cardinal symptoms are dyspnea, wheezing, and cough.